I think you're right, the body may not have been that long! Only once did I have to persuade one to bend its legs before putting the glass over it!!! Not in the UK I hasten to add. Lol Nigel, I had same problem when I encountered a Huntsman spider on my first week in Australia when it was climbing up the bedroom wall !! We were in a motel/apartment at the time and only had mop and bucket to hand but it worked perfectly so I could put it back in the garden lol Was just a harmless (would only bite to defend itself lol ) member of the Sparassidae family. At the time if was a pretty daunting sight because of the sheer size of this insect ! post edit: LOL I just read this article !! You were brave putting out that size spider during your first week over in Australia Hazy, think I might have called in the reserves!! My latest Spider ... reasonably manageable! 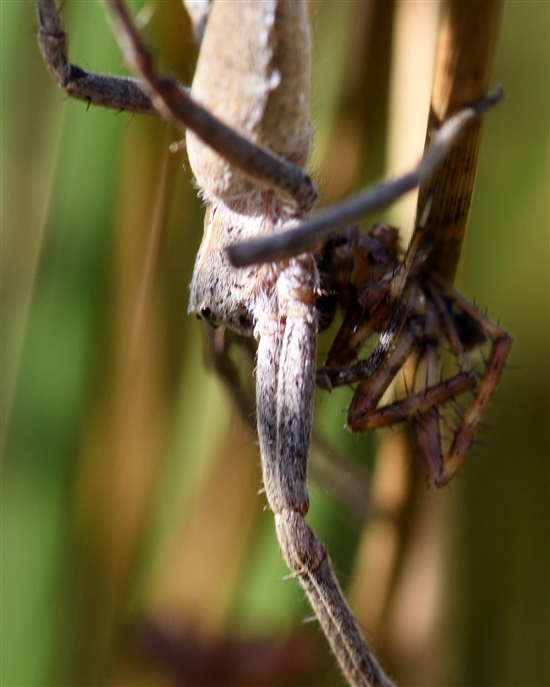 I found another Nursery Web Spider, so probably nearly as big as a humungous house jobby … and this time, apparently having dinner. I'm not sure but it might be tucking into another spider. Phew!!!! That's enormous!!!! and I have to say I have a bone to pick with spiders. I thought I would leave a few around the house to catch the flies, but no, all they do is eat each other, even the small ones lie in wait, I stood and watched this little thing heading towards another and blow me it was wrapped up in a parcel and disposed of in no time!! !